Hiya guys! I don't know about your home state, but in Jersey it has taken a toll back towards summer. It's just so warm and humid outside, I'm so annoyed. Especially because most of my summer clothes and shoes have been put away, haha. I hope you guys are having more of a Fall than I am so far. So anyhow, today I'm sharing swatches for the newly released Autumn Nights Collection by Poetry Cowgirl Nail Polish. 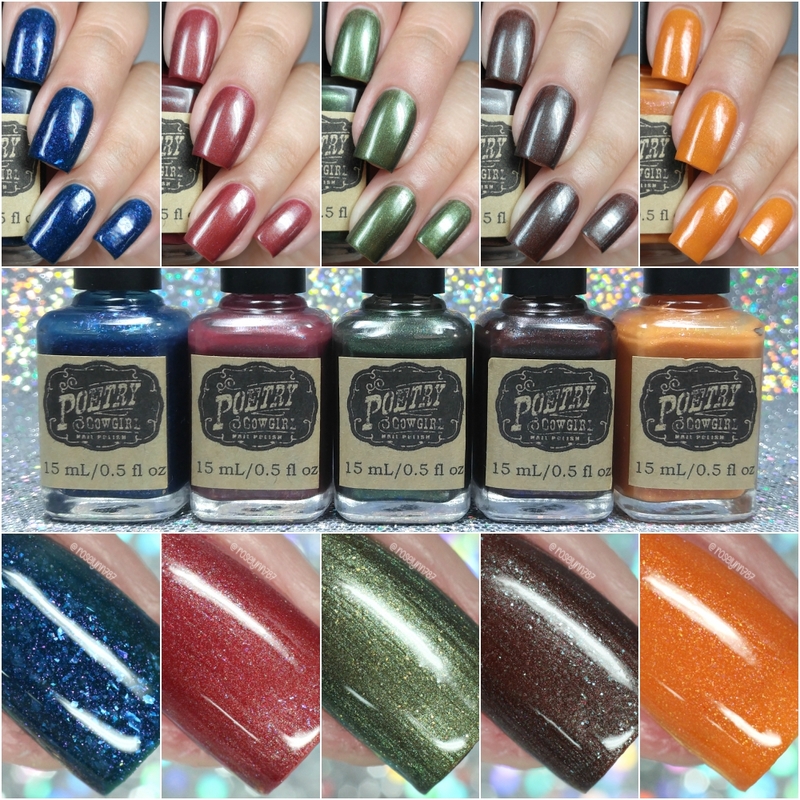 This collection is made up of Fall tones in gorgeous shimmer bases. Let's go ahead and get to the swatches! 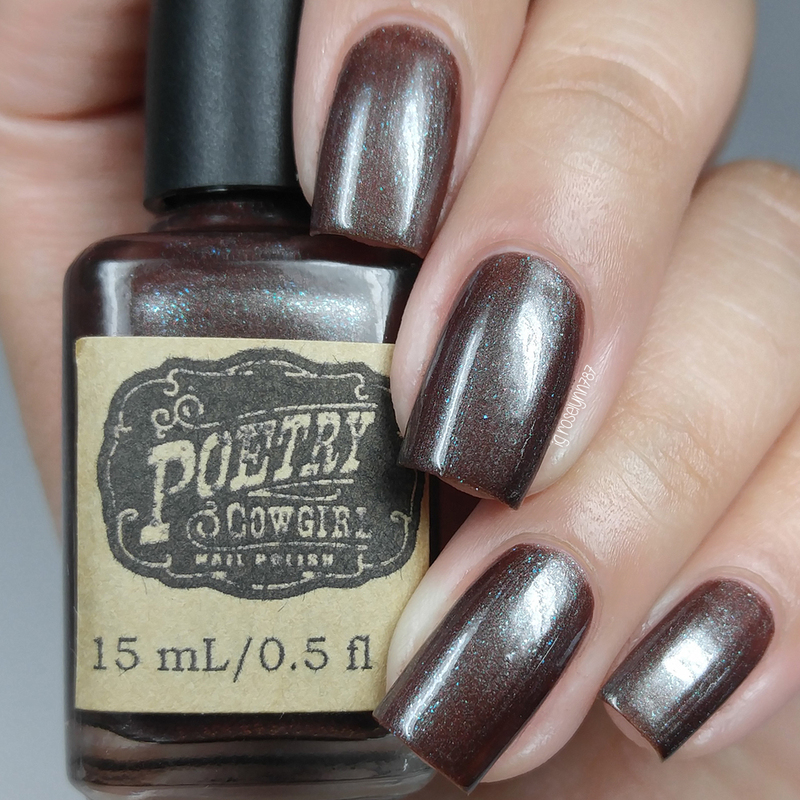 The Autumn Nights Collection by Poetry Cowgirl Nail Polish is now available for purchase. Each full-size 15mL bottle retails for $10 or in mini-size 8mL for $6. You can also purchase the full-size set for $45 or in mini-size for $27. 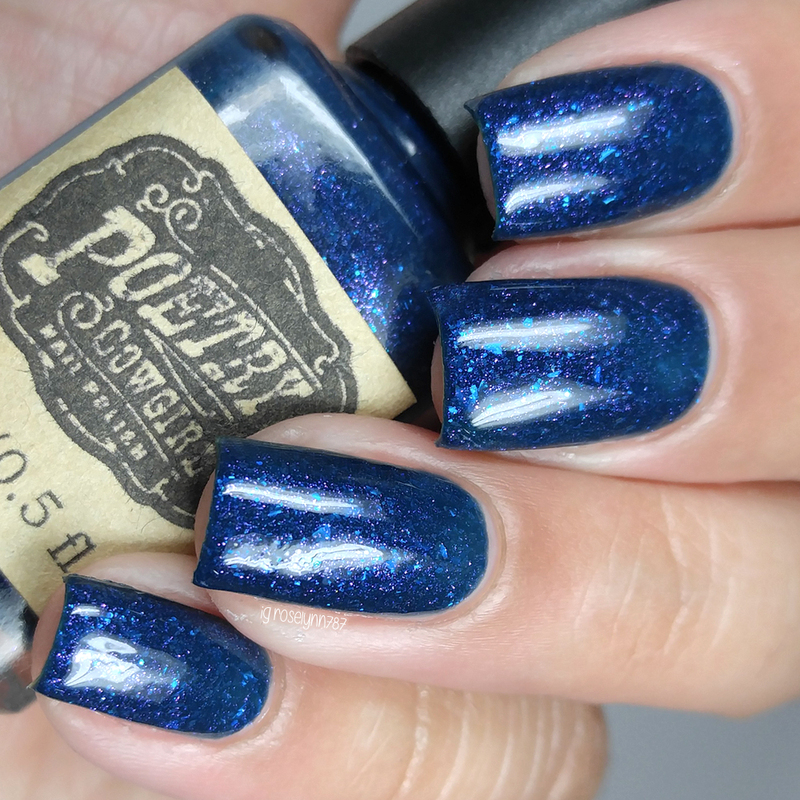 Autumn Twilight can be described as a deep blue jelly packed with blue flakies and micro flakies and a hint of pink shimmer. Seeing these photos, I wish I would have thought to matte this polish. It just looks so squishy and jam-packed full of flakies. The formula has a sheer application, but that's to be expected from a jelly. The consistency is a bit on the thick side, but still manageable for layering. It dries to a gritty finish that will need a thick layer of topcoat to smooth down. Shown in three coats and sealed with a glossy topcoat. 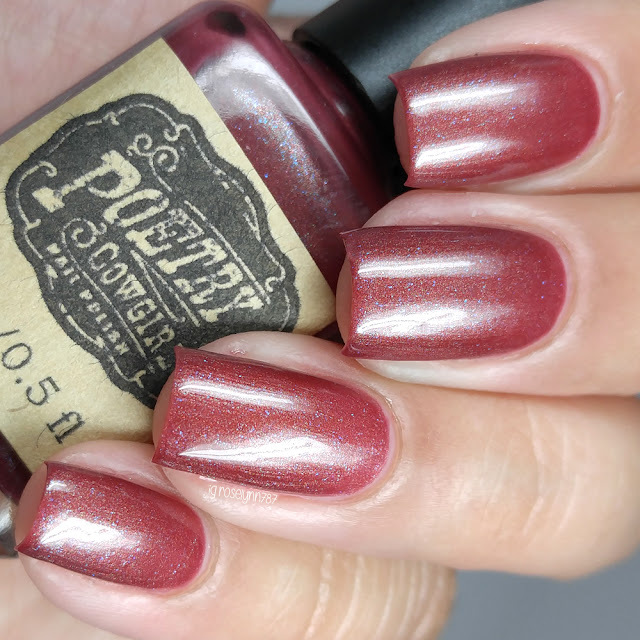 Raspberry Wine can be described as a rich berry colored shimmer with red and blue sparkles, and a slight green flash. One of my two must-haves in this collection, the tone of this shade looks so gorgeous and unique. The formula has a sheer application, but builds up evenly on the nail. Great consistency as well, not too thick or thin. I did experience staining on removal though, even through a base-coat. Personally I don't mind staining and even so I ended up being able to scrub most of it away. Shown in three coats and sealed with a glossy topcoat. Some Trees Don’t can be described as a deep, blackened green shimmer with gold flecks. I really love this shade of deep green, it compliments my skin tone so well. The consistency on this one runs a little more on the thin side, but not to the point of being runnlsoy. There are a a few visible brush strokes in the finish that mostly blend out after a topcoat. Shown in two coats and sealed with a glossy topcoat. 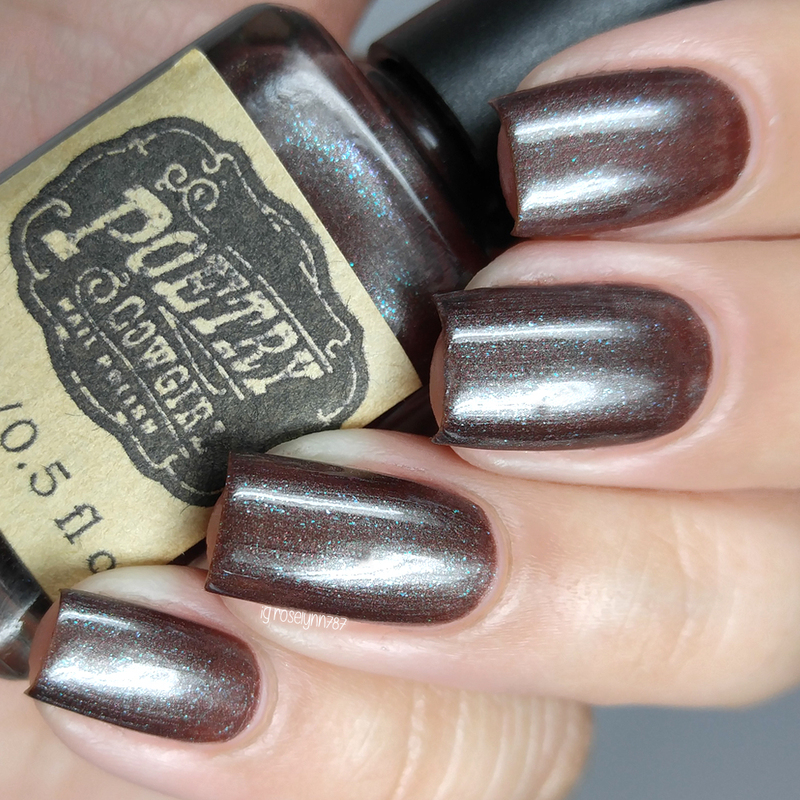 Spiced Hot Cocoa can be described as a rich reddish-brown shimmer with hints of red, green, and blue sparkles. And here's my other pick for must-have, I love the unique combination of the shimmer and base. The formula has a great application, very smooth and opaque. Again here you'll see very minimal brush strokes in the finish before topcoat. Shown in two coats and sealed with a glossy topcoat. Pumpkin Everything can be described as a warm orange crelly with red and blue sparkles, and gold flecks. Another day, another orange shade to fall in love with. The shimmering flecks are subtle, but they add depth to this otherwise creamy shade. The formula has a bit of a thick consistency, but it's very manageable and easy to work with. Very opaque and needs minimal layering full coverage. Shown in two coats and sealed with a glossy topcoat. Overall I really love this collection so much more than I thought I would. This year feels like the year of the shimmers and oranges, both have won me completely over. It's actually hard for me to fathom that I used to hate this kind of finish this time last year! As I mentioned, I definitely feel like Spiced Hot Cocoa and Raspberry Wine are total must-haves. All in all though, these are so gorgeous and I think Kristen really nailed the Autumn vibe in each one. Those are my favorites, which ones are yours? Let me know which ones you guys will be getting down in the comments! 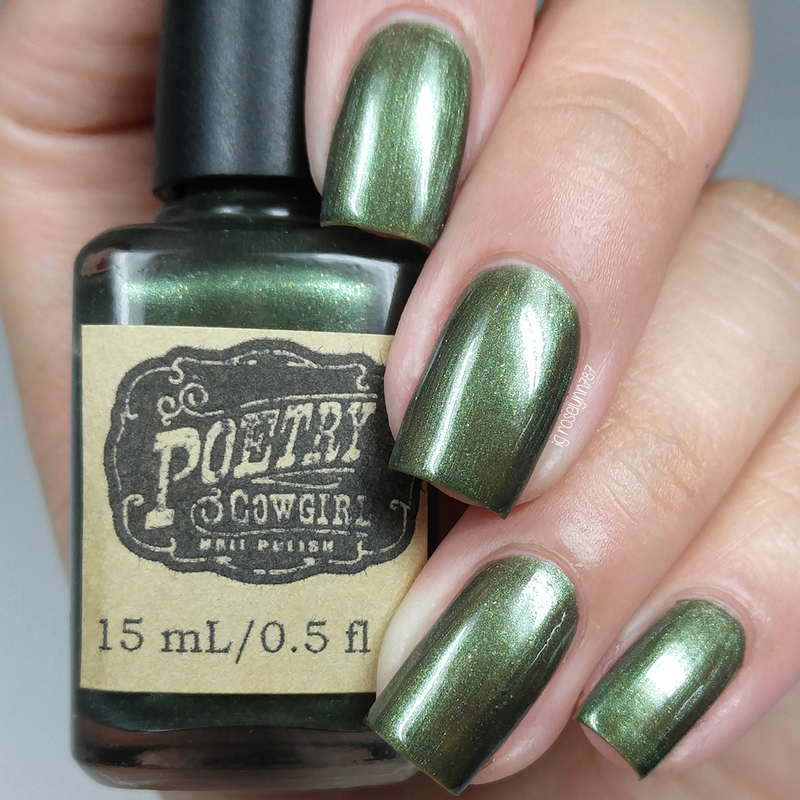 To recap, the Autumn Nights Collection by Poetry Cowgirl Nail Polish is now available for purchase. 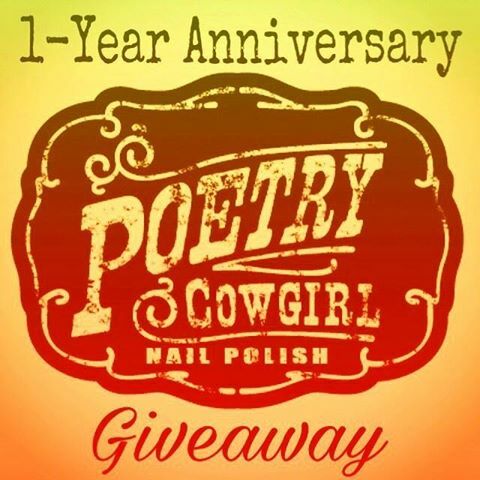 Each full-size 15mL bottle retails for $10 or in mini-size 8mL for $6. You can also purchase the full-size set for $45 or in mini-size for $27. Autumn Twilight makes me think of icebergs at night. Totally weird, but I love it. Oh dear god, that orange. 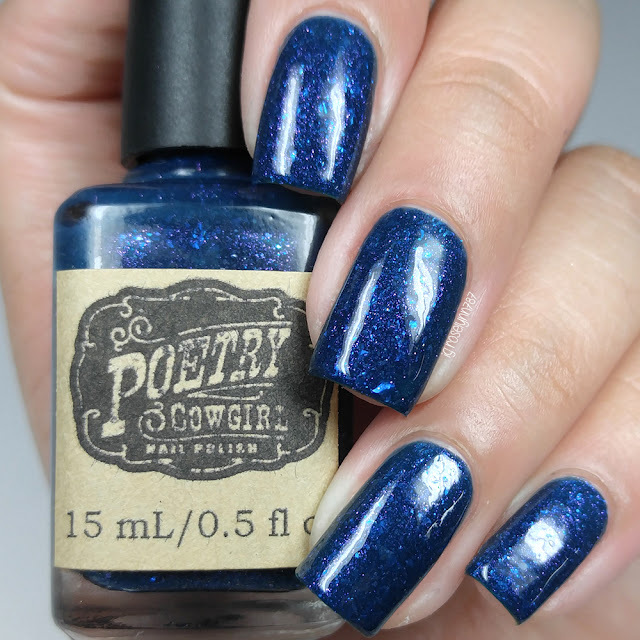 I loved it on the swatch wheel, and I love it on you now. Pumpkin Everything and Spiced Hot Chocolate are both stunning. Some are a little too frosty for me but they all remind me of fall. I really like these bottles. A great selection of colours and lovely swatches. The brown kinda reminds me of the MAC Blue-brown pigment. I might need. Nice collection! My favorites are Autumn Twilight and Pumpkin Everything. Omg Autumn Twilight is gorgeous!